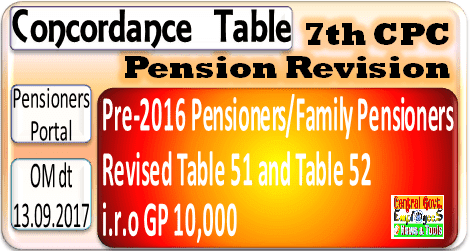 Subject: Revision of pension of pre-2016 pensioners / family pensioners in implementation of Government's decision on the recommendations of the 7th Central Pay Commission- Concordance tables- regarding. The undersigned is directed to refer to this Department's O.M. of even number dated 06.07.2017 on the above subject and to say that there is some error in the entries relating to the pre-revised pay of Rs. 56050/- (6th CPC Grade pay : Rs. 10,000, 7th CPC Level 14)) in Table 51 and Table 52 enclosed therewith. 2 It is requested that the existing Table 51 and Table 52 may be substituted by the enclosed Table 51 and Table 52, respectively. The revised entries have been shown in bold letters.